"Soratnik UCGV was tested in conditions as close as possible to combat. 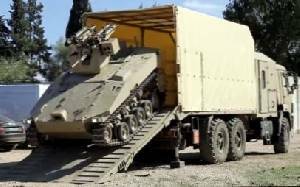 These tests confirmed the characteristics of the complex and proved the possibility of using this robotic system at an air temperature above 30 degrees Celsius,” the press service of the Kalashnikov concern reported. They clarified that the scientific and technical experience that was obtained in the development and creation of Soratnik, as well as the results of its tests, will form the basis of advanced combat robotic complexes. The armored tracked vehicle Soratnik is designed for reconnaissance, retransmission, patrolling and guarding of territories and important facilities and demining. Soratnik operates in three modes of control, the weight of the UCGV does not exceed 7 tons, it can reach speeds of up to 40 km/h. With remote control and line of sight, the range of the vehicle is up to 10 km. On the tracked platform can be integrated guns of caliber of 7.62 mm and 12.7 mm, as well as an AG-17A automatic grenade launcher of the caliber of 30 mm. The weapon station is equipped with gyroscopic stabilization of weapons and is able to independently detect, track and destroy targets, determining their type. In addition, it is possible to install eight anti-tank guided missiles of the type Kornet-EM on the Soratnik. The UCGV can also work in conjunction with drone. http://nyxcosmetic.ru/ интернет магазин профессиональной косметики.